People have good reasons to call Mr Raja Segran “Singapore’s Birdman”. The 55-year-old former birdkeeper is now the general manager of Jurong Bird Park, one of the world’s largest bird parks. As a child, he grew up in the Jurong Hill neighbourhood, and his parents were “bird crazy”. His family lived in an old terrace house with a huge garden, which was surrounded by plants and trees. His father loved parrots while his mother kept chickens, ducks and turkeys. She also looked after abandoned or injured birds. “We were like a neighbourhood rescue centre,” recalls Mr Segran, who was already raising mynahs when he was six. When he finished school in 1975, his father coaxed him to apply for the job of an assistant birdkeeper at the nearby Jurong Bird Park, which opened in 1971. He was assigned to the Birds of Prey exhibit and worked with some of the largest eagles in the world. His salary then was $223 a month, which was more than what he expected. For the next three decades, he served burgers at the park café, cleaned cages, trained birds of prey, talked and sang to parrots, learnt about animal husbandry and got acquainted with the art of being a good leader. “Zookeeping is not just about cleaning and feeding the animals. “If you work with birds, it is up to you to do your best to keep the birds physically and mentally fit and happy,” he says. Mr Segran now oversees an award-winning aviary enterprise which houses about 5,000 birds from over 380 species. He sometimes feels like a walking library on the history of the park. He is pleased that many zoos and bird parks today are institutions of learning. 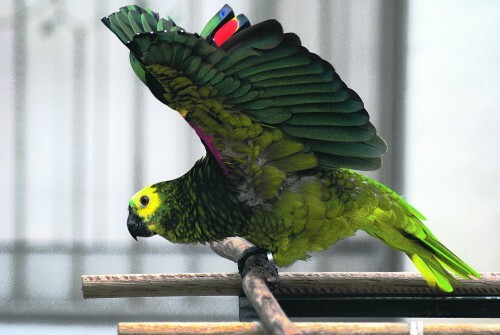 “Through years of careful planning, we have transformed Jurong Bird Park into a world-class attraction with emphasis on research and conservation, which has attracted highly motivated individuals with diplomas and degrees to venture into this field,” he says. In his early years, when he was involved in talking to birds, he conducted more than 40,000 bird shows in Europe, Australasia, Asia and the United States. He recalls: “Among my hair-raising experiences was getting clawed by an eagle, and its talon went through my hand and came out the other side. “Once, a cockatoo bit my thumb and the nail came off. Of his unique job, he says: “Either you have it, or you don’t. “Your (voice) matters, particularly the tone, in talking to birds. “They look forward to the tone of voice that they’re hearing because it could mean a reward. “Birds are very intelligent creatures that enjoy communicating. “They observe the body language, tone of voice and confidence of aspiring birdkeepers. He adds: “I’ve been around birds more than people, and I used to have a bird in hand wherever I went. He says he owes his success to his parents. “My parents were instrumental in imparting their interest and gave me the opportunity of growing up around birds and nature,” he explains. Even today, his father, at 86, still takes time to listen to the birds and makes him breakfast every morning.